Here is a diagram for a simple 48-volt heating control system for a 3 metre ‘recipe‘ turbine. I did this design for Dr Francis Greaves in Ireland. There is no battery but the voltage is stabilised by the bank of capacitors (recommended minimum 20,000 microfarads ,by connecting multiple capacitors in parallel). The main heating load (lower right) is controlled by an LDR controller from Solar Converters (I can supply these too). It’s important to connect the sensing terminals or it will not work. The heating load can be resistors (such as 2 of these in parallel) or a water heater from TP Fay for example. Use a rectifier to convert the 3-phase AC to DC. Here is a nice simple one or you can use multiple single phase ones to do the job for lower cost. Mount the rectifier on a heatsink. A string of small resistors feeds the over-voltage trip relay. You could use a potentiometer to adjust the tripping voltage if you want to spend more. Or simply add resistors until it just stops tripping. This relay protects the LDR against excessive voltage in gusts. It will remain closed until the voltage drops right down. When energised, the trip relay connects a dump load to the AC source. This can be via another rectifier as shown, or you could use 3 such resistors connected in delta. It’s easier on the relay to switch AC rather than DC. I also show a brake switch that can for example be a big 2-pole mains voltage switch like this. This is for parking and safety. It stops the turbine. It’s tricky to use a thermostat to control a DC load and it might damage the LDR if you were to turn off the heater but you could contrive a way to trip the relay on using a thermostat, thus stopping the wind turbine. You could probably get better performance and higher peak power by adding another heater just after the main rectifier (in series with the DC stuff) before the trip relay wires branch off. This would allow the blades to run a bit faster and give more power without adding to the current in the windings. But it complicates the installation a little bit. I see no need for fuses or circuit breakers here since there are no dangerous sources of high current, but be aware that the wind turbine could produce dangerous voltages if allowed to run without a load. This is partly why it’s a good plan to have a trip relay. 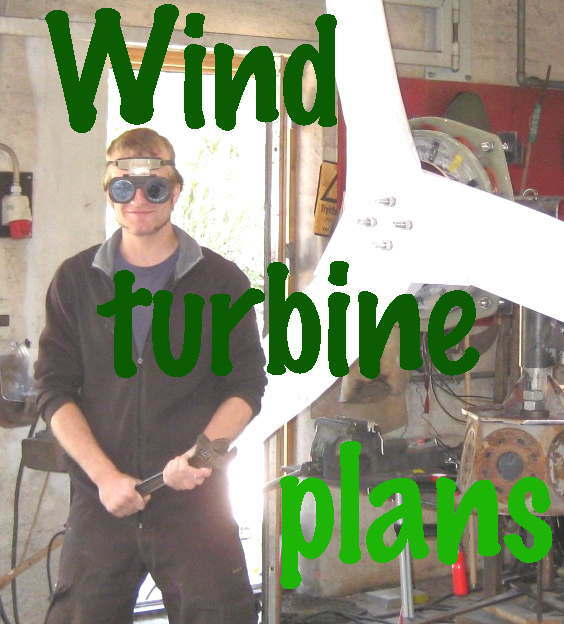 This entry was posted in construction, products/technical, wind systems tutorial. Bookmark the permalink. If you want to use just one heater then you will need a pwm controller like the LDR. Solar converters do make a 180 volt, 10 amp version that would suit your needs. Although I’d actually recommend using two of them, and having a second heater to prevent over-voltage of the first one. There’s something to be said for having a heater in series with the wind turbine too, so as to get variable voltage performance. I don’t keep these higher voltage LDR units in stock here so you might do as well buying direct from solar converters in Canada. Take care to read my page on the subject though, as there are several errors/omissions in their documentation. I’m halfway through a 4.2m turbine build. I have decided to wind the stator wires suitable for a for a grid tie inverter (140 to 350v). wire not bought yet. However before investing in a grid tie inverter I’d like to test the turbine by using it to direct heat my copper cylinder for the first year. Preferably with just one heating element. All the circuits I have found are for 12v to 48v battery dump loads or similar. Have you or Solar Converters anything in your arsenal which would make this work? If you are using an immersion heater then the thermostat is an issue. I’d recommend a system where a thermostat is used to operate a pump that removes heat from the tank into heating the house and then a safety stat that operates a shut down of the turbine maybe via the trip circuit or a direct short circuit relay. The circuit above can also be used with a grid connected inverter although the inverter settings would need to be at a voltage below the operation of the heater and so you might not get so much power as you would with a wider voltage range. Im based in South Kilkenny and awaiting my manuals (ordered last week and in the post thanks Hugh) to arrive so I can start production. I’d be interested to have a chat if you wouldnt mind?